Kitchen Island Ideas – Having big size kitchen is a dream of most of cooking lovers. Big kitchen will make them easily move around and prepare the food. However, that’s not entirely correct. Big size kitchen with too much empty space can be really troublesome. It can waste your time, if you have to move around from one side to the other side, just in order to prepare your food or take the utensils that you need. So, how can we solve that problem? Actually, it’s easy to do. 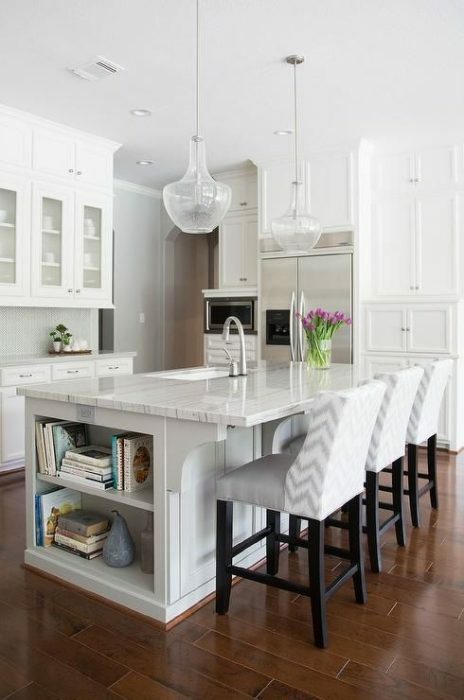 Putting a kitchen island is a good solution to fill the empty space on your kitchen. Kitchen island is also has valuable aspect especially as a kitchen table, storage, and install the faucet. 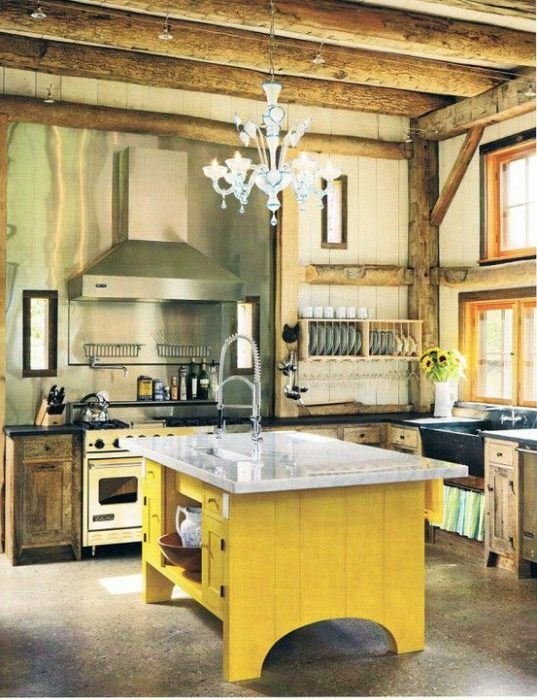 For those who love to apply rustic kitchen model at home, just try to apply yellow kitchen island. Traditional kitchen tend to use wooden materials and neutral colors. Yellow is a contrast color but it balances the kitchen. Combine it with white ceramic kitchen table, white chandelier and wall paint. 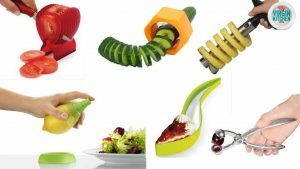 The combination makes your kitchen looks cozy and fresh enough to cook delicious foods everyday. 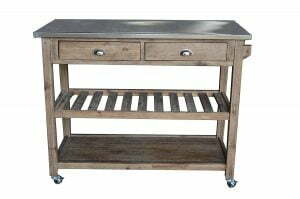 Wooden furniture is one of popular items including wooden kitchen island. The main reason is because wood gives unique color, pattern, and texture. Wooden furniture is also stronger and longer lasting. 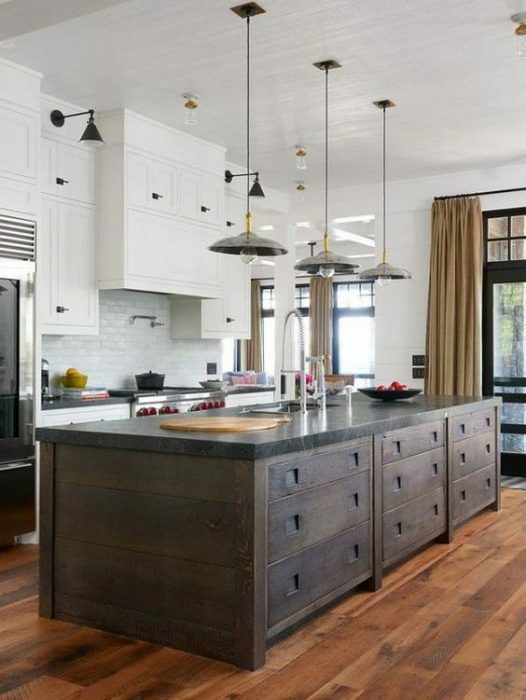 Place the wooden kitchen island on wooden flooring and take a little bit contrast color. 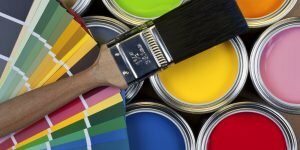 Mix it with white wall painting and kitchen cabinet. Just installing hanging lamps with bell lampshade at the top of the kitchen island and make it perfect. Kitchen Island is applicable for any kind of kitchen model including modern kitchen design. You may apply a wooden gallery kitchen island. Just make a custom model which can put a small long chair and you can store the chair on the kitchen island anytime you don’t use it. Use specific colors such as white, black, dark purple, and cream to keep your modern kitchen simple and neat. This mixture gallery kitchen cabinet is also a good option for semi modern kitchen design. You may combine two different materials only which are wood and ceramic there. It keeps your kitchen simple. 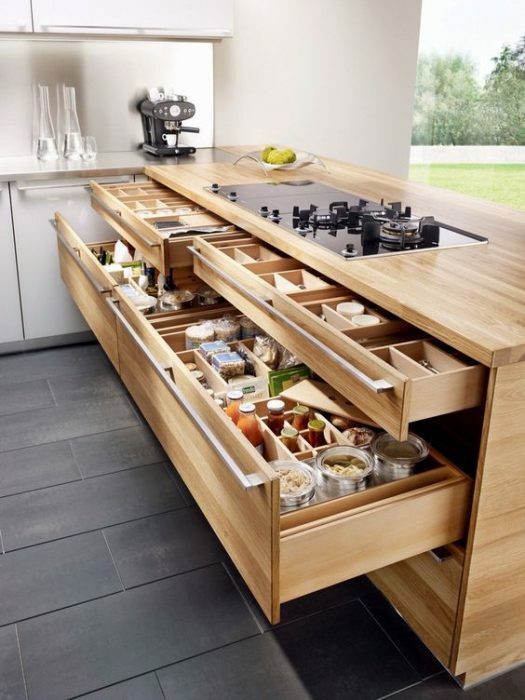 Just choose a kitchen island with a lot of cabinets so you can keep all the important kitchen utensils there. You can also try to apply three different colors only, white, chocolate, and black. 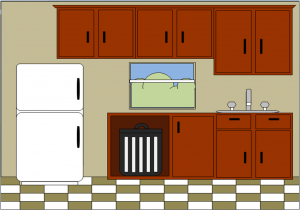 Creating a modern kitchen can be done by playing with color option. Let say, you just need to combine three different colors such as dark blue, white, and wooden color. 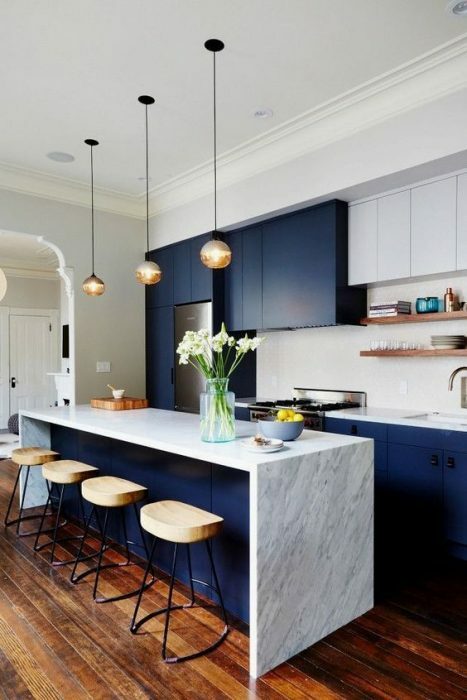 Use the dark blue for the kitchen island and mix it with white ceramic with soft black texture. Placing some bar chairs and hanging lamps with round lampshade will make your modern kitchen looks tidy and simple. 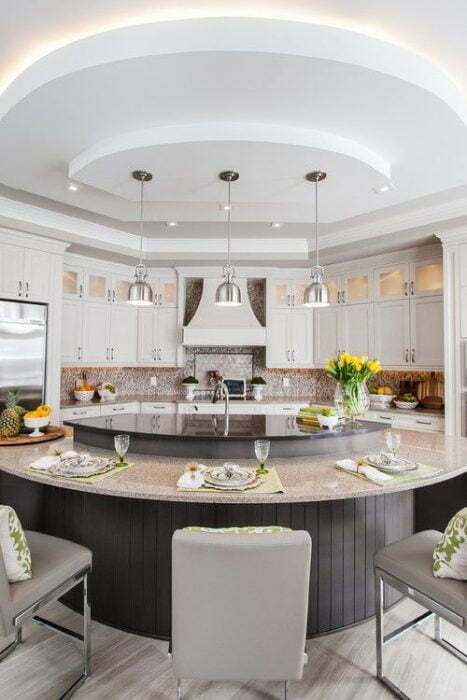 For those who have small kitchen area, you may use circular kitchen island. The circular table can be used as a beautiful and tidy dining table. If it is necessary, you can just put two different tables, a table to support the kitchen island and a table for the dining area. Don’t use too much color so it doesn’t look too crowded. 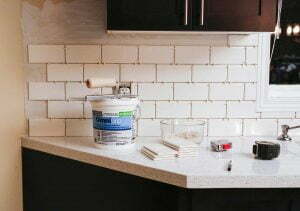 Take white as the base color and mix it with black color or ceramic material and backsplash. Add some hanging lamps and chairs to increase the warm atmosphere. It is also possible to use the kitchen island for a dining table. What you have to do is locating the kitchen island separately with the kitchen area but don’t too far. Soft green kitchen island is perfect if you want to create rustic kitchen area. 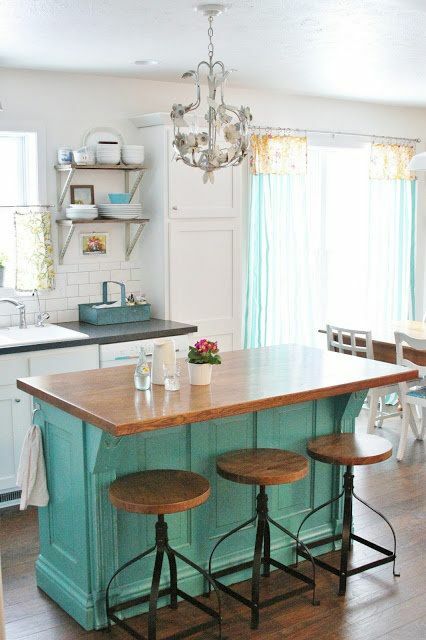 Combine the color with wooden kitchen table and add some bar chairs. That’s it! You are about to have a comfortable rustic kitchen area along with cool dining area. Playing with contrast color is also a worth it to create a cozy kitchen area. 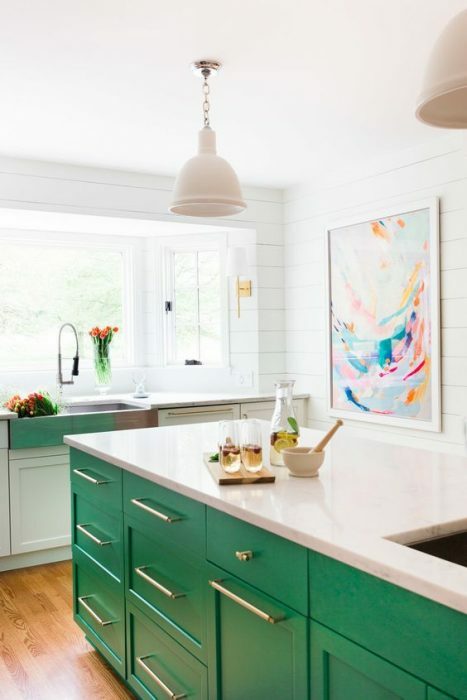 To make it simple and easy to combine, just use white for the base color and apply it for the wall painting, kitchen table, hanging lampshade, and cabinets. Now for the contrast color, you may apply dark green kitchen island. The color gives strong separator between the floor, table and the different kitchen area. Give texture by applying white wooden deck looked like wallpaper and colorful abstract painting. The best part of putting a kitchen island is because you can also have some cabinets to keep the important kitchen utensils there. This gallery kitchen island is the best example in which it is used to install a modern stove as well as some of kitchen rectangular kitchen cabinets. Use it to keep herbs, plates, spoon, napkin, and any kind of utensils and ingredients there. 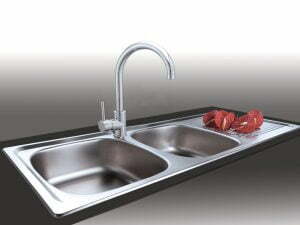 Do you want to separate between the kitchen sink area and the area to serve the foods? 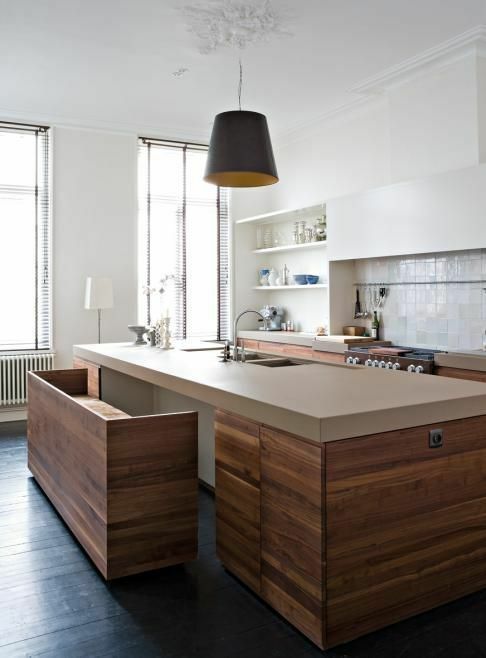 If it is so, applying a galley kitchen island with L shaped table is a perfect one. Try to design the L shaped a little bit higher than the kitchen sink area. 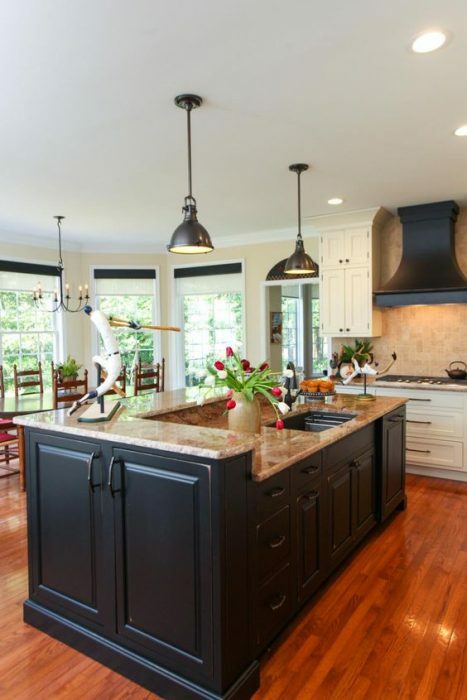 For classical kitchen model, use black kitchen island along with chocolate ceramic kitchen table. The key is not to combine too many colors. You may add some accessories such hanging lamps, mosaic backsplash, and chandelier to make the kitchen comfortable. We can’t doubt that white is always effective to create charming area including kitchen. For creating modern kitchen, you may use white kitchen island and combine it with black ceramic table. 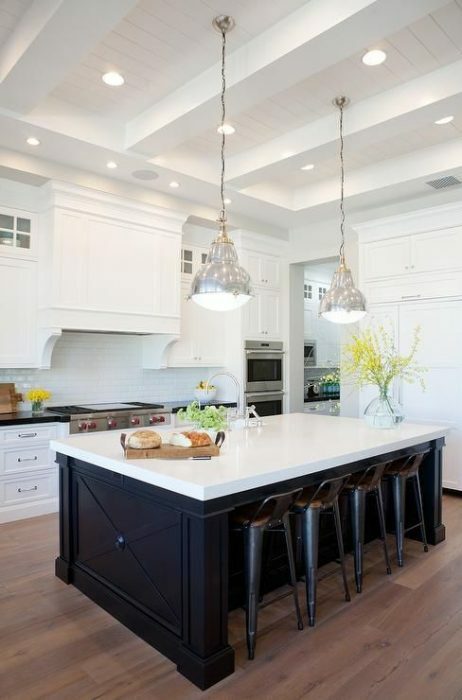 Make the kitchen balance by using wooden bars flooring, white hanging kitchen cabinets, and black and white backsplash. 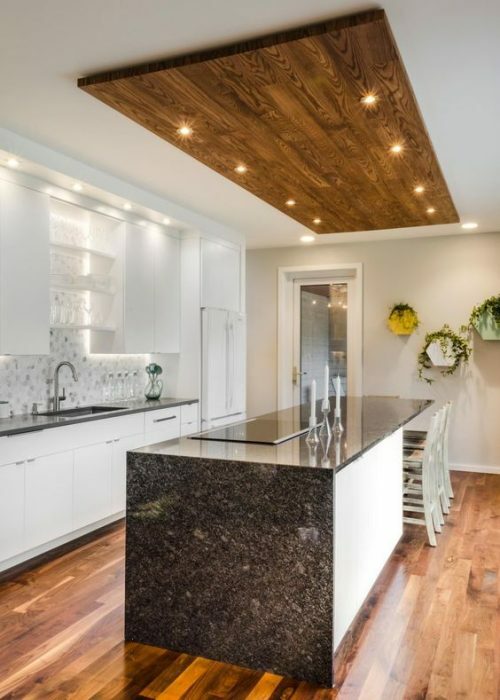 If you want to make the kitchen looks unique, try to install a wooden square on the ceiling and use it to install small bulbs there. 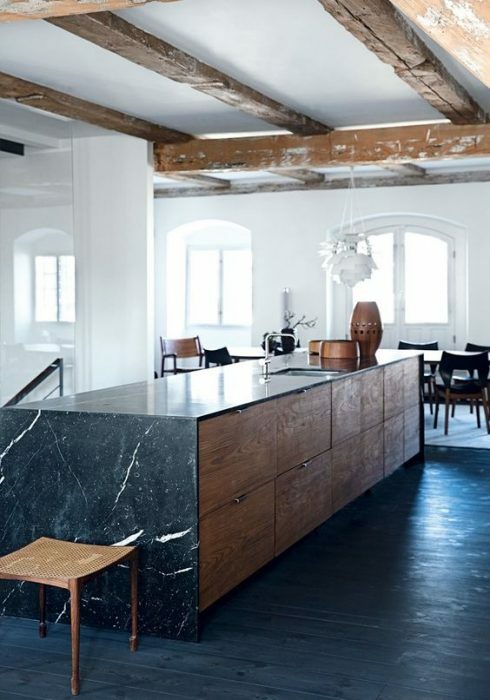 Black and white kitchen is chosen because of its simple and neat ambient. Just add specific items such as black kitchen island and combine it with white table. Actually, it is enough to create modern and simple dining area. You don’t need to think too much and just apply white kitchen appliances including kitchen cabinets, shelves, and many more. To give great atmosphere, you may apply wooden flooring, hanging lamps with silver bell lampshade, and colorful real flowers. Rustic kitchen is used because it gives cozy atmosphere and for those who always want to feel village sensation. 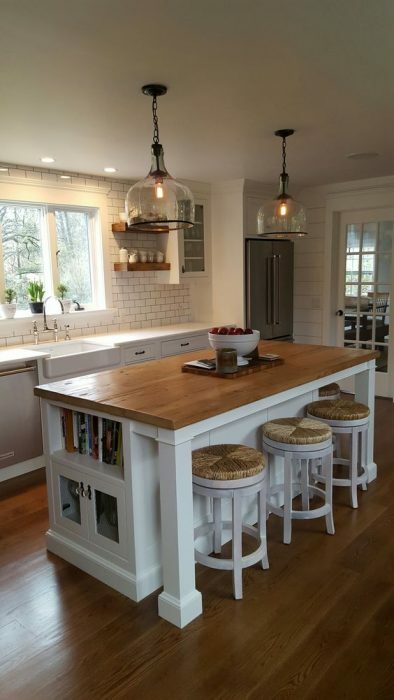 If you also want to apply rustic kitchen, just take white kitchen island. Then combine it with wooden table and white wall painting. Brick backsplash is also good to give texture. Complete it with round bar chairs and hanging lamp with glass lampshade. So, can you feel the rustic ambient already? Just make your kitchen comfortable by remodeling it into natural kitchen design. 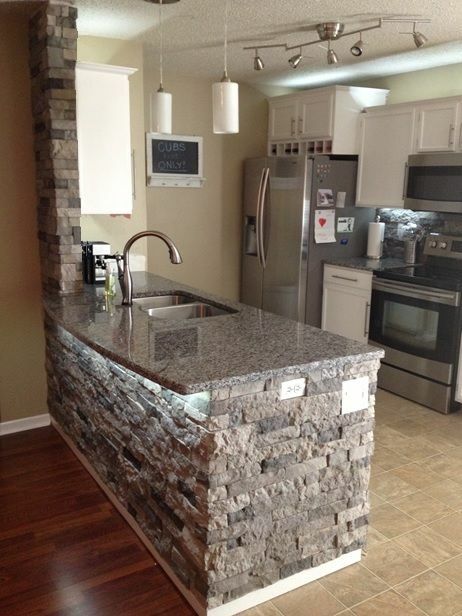 What you have to do is using gallery stone kitchen island. The stone makes the kitchen island looks soling and strong. It will be stronger along with ceramic table. You don’t need to give too much texture because the stones create unique natural texture around the kitchen. The kitchen will be simple but neat as well. White is not a monotonous color as long as you can mix it well. 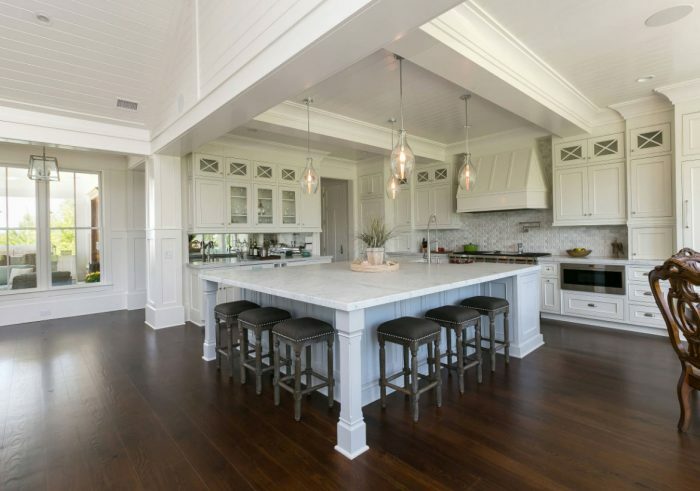 You may use white kitchen island, kitchen cabinets, kitchen storage, and many more. The fun part begun! 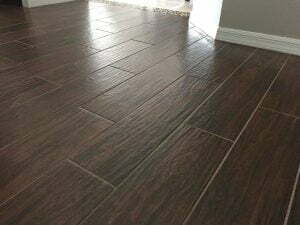 Mix it with wooden flooring to give chocolate color and chairs with black chair frame. Choose something made of stainless and glass to balance everything. What a great kitchen, right?